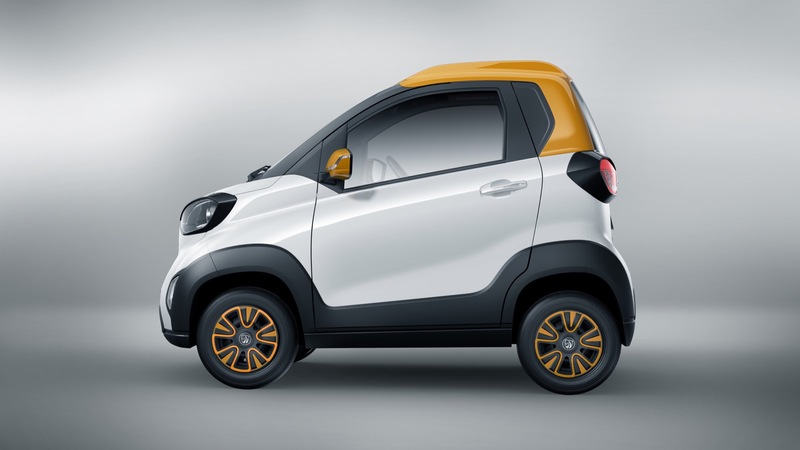 The Baojun E100 is a battery electric vehicle produced by SAIC-GM-Wuling (SGMW), a China-based joint venture between General Motors, SAIC and Wuling. 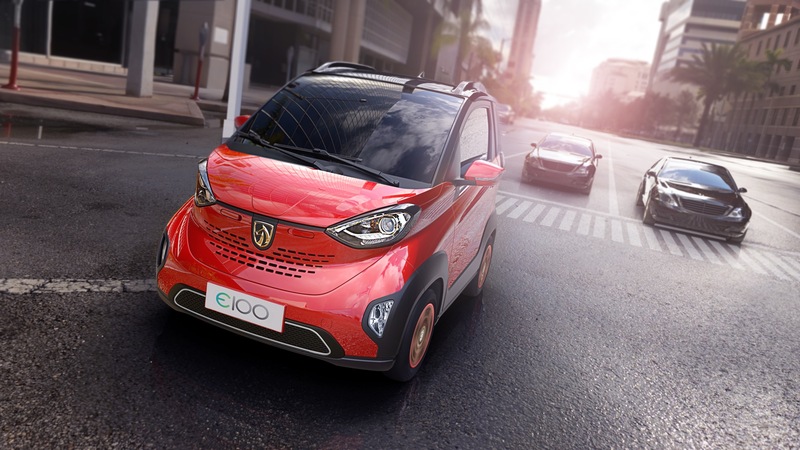 Notably, the E100 is Baojun’s first fully-electric vehicle. The E100 is comprised of a small footprint, with a rather stubby front and rear ends. 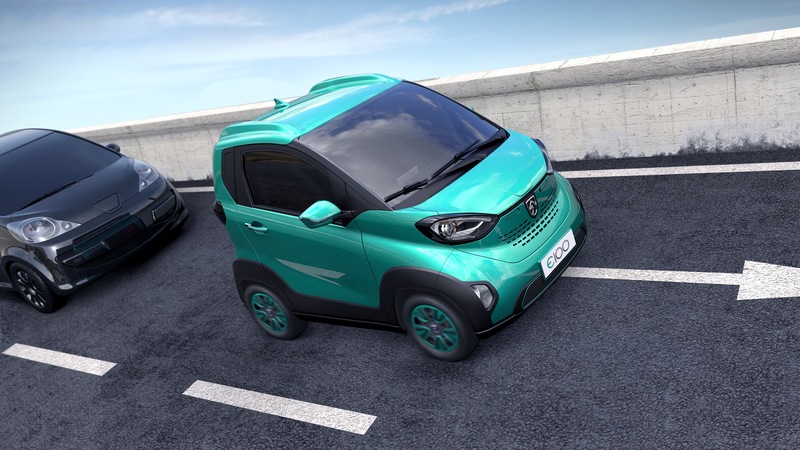 The design is somewhat reminiscent of Daimler’s Smart Car lineup. The model features two doors and a hatch at the rear. Small, 12-inch wheels yet rather large headlights and taillights are some of the defining characteristics of the vehicle’s design. The model also features low-placed fog lights at the outer edges of the front bumper cover. Notably, the hatch features a unique attachment at the prominent roof-rails. 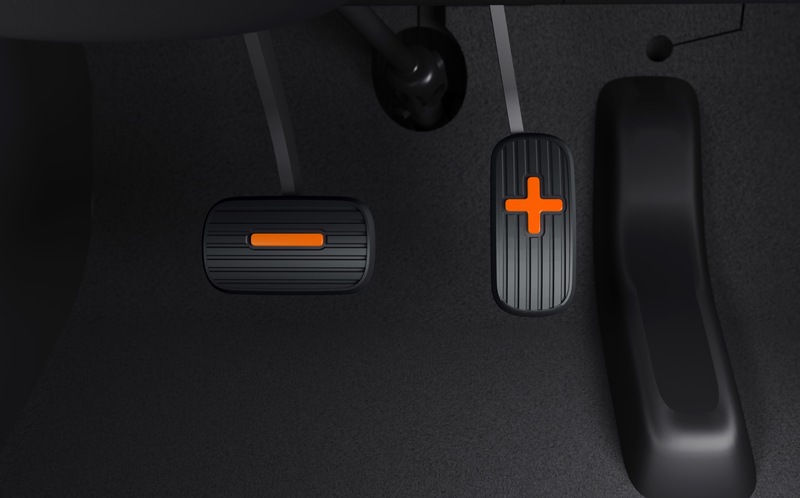 Despite the limited surface area to produce an attractive exterior, designers used color to make the E100 noticeable. 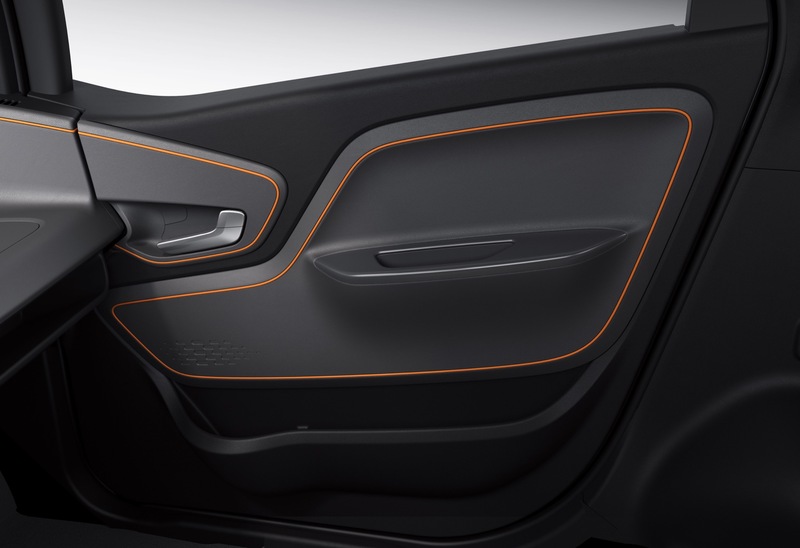 For instance, the primary body color can be complemented by two accent colors, a black/dark grey hue on the lower end of the car and another color on the B-pillar, roof rails, and wheel accents. The E100is powered by a single motor that produces 29 kW (39 horsepower) and 110 Nm (81 pound-feet) of torque, enabling it to travel up to 155 km (96 miles) on a single charge. The lithium-ion battery pack can be fully charged in 7.5 hours, with the pack being capable of capturing energy through a regenerative braking system. 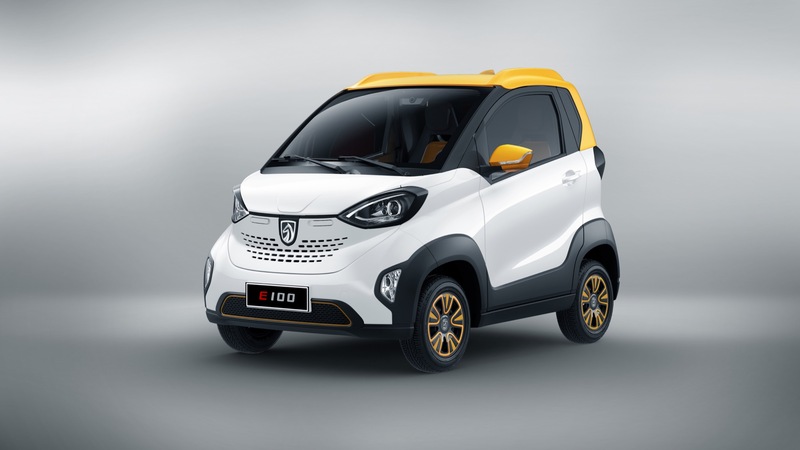 The vehicle has a maximum speed of 100 km/h (62 mph), allowing it to travel on local roads and urban expressways, making it a vehicle capable of handling urban daily commutes in China. 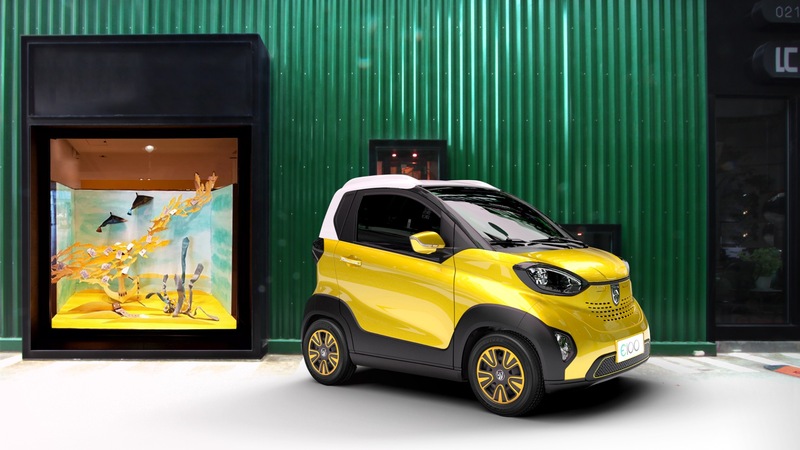 In June 2018, Baojun launched an upgraded E100 that added an improved driving range of 200 km and various functional upgrades. With a wheelbase of 1,600 mm (63 inches) and height of 1,670 mm (65.75 inches), the compact E100 seats up to two adults comfortably. 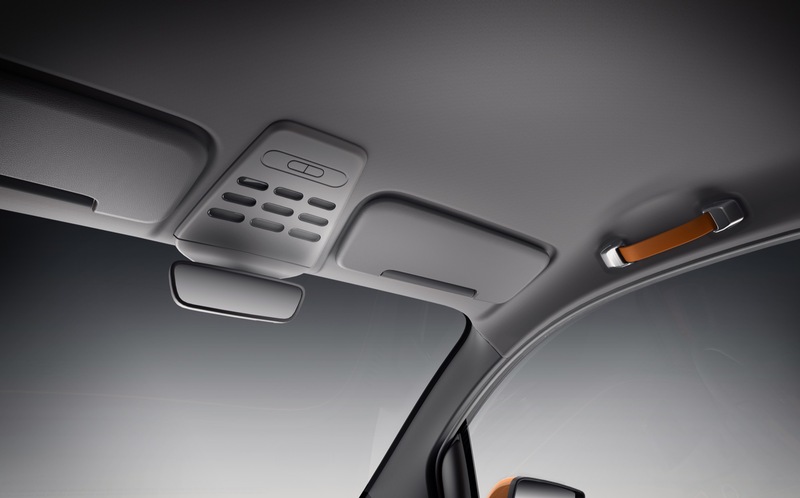 The Baojun E100 features a 7-inch screen and Wi-Fi, enabling users to enjoy infotainment and remain connected while on the road. 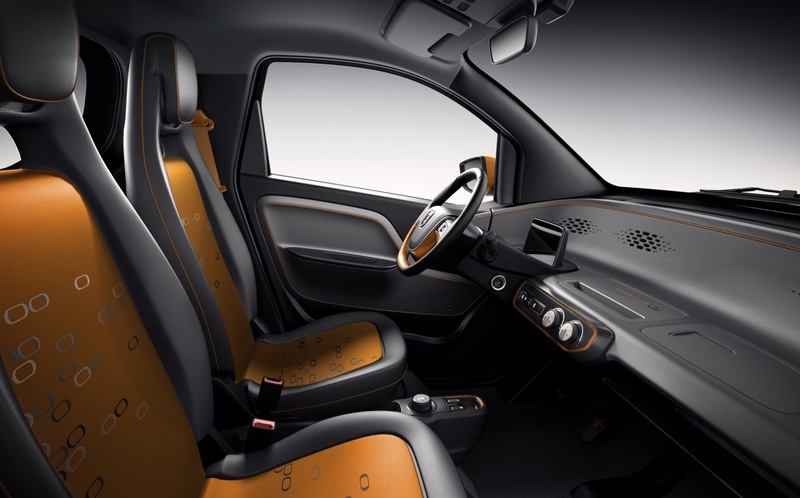 The electric vehicle is also available with a touchpad, air filter and keyless entry on the premium Zhixiang variant. The E100 uses an independent front-wheel suspension and single-arm rear suspension. 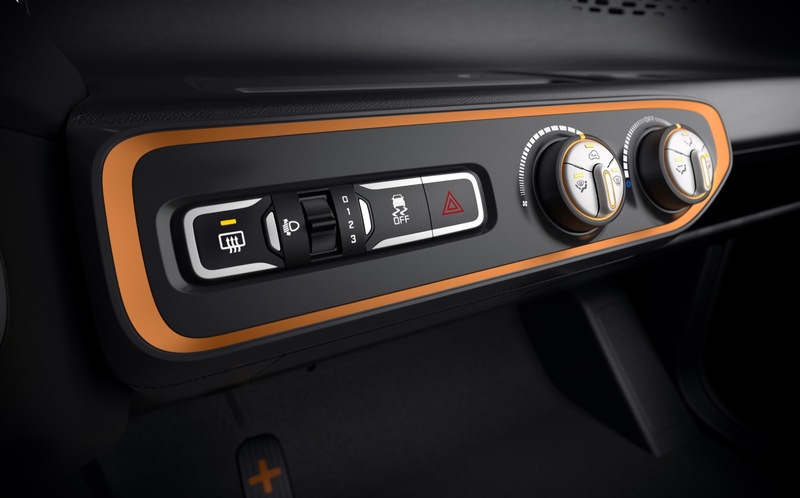 The car features anti-lock brakes with electronic brakeforce distribution, electric power steering, an electronic parking brake. Its turning radius of 3.7 meters enables it to get in and out of tight spaces conveniently. 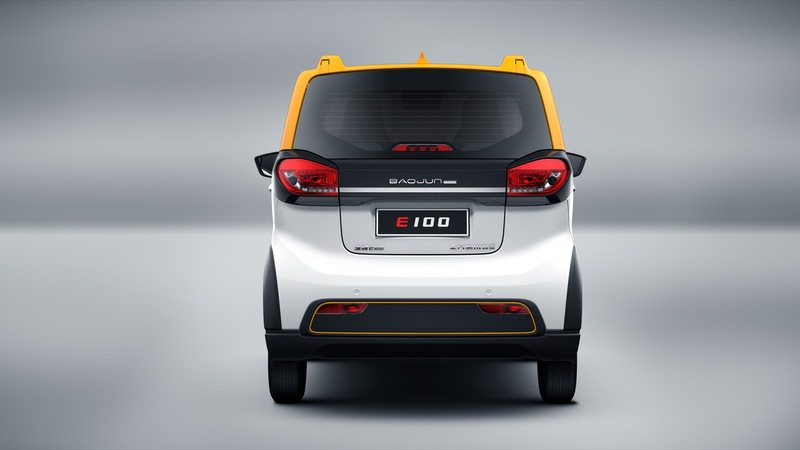 Baojun E100 features parking sensors, ISOFIX locks for child safety seats and a pedestrian alert system. On July 10th, 2017, SAIC-GM-Wuling began limited pre-sales of the E100 in the city of Liuzhou, in the Guangxi region. Over 5,000 people registered for the first 200 vehicles. Another 500 vehicles became available the next day. Sales were initially limited to Guangxi. 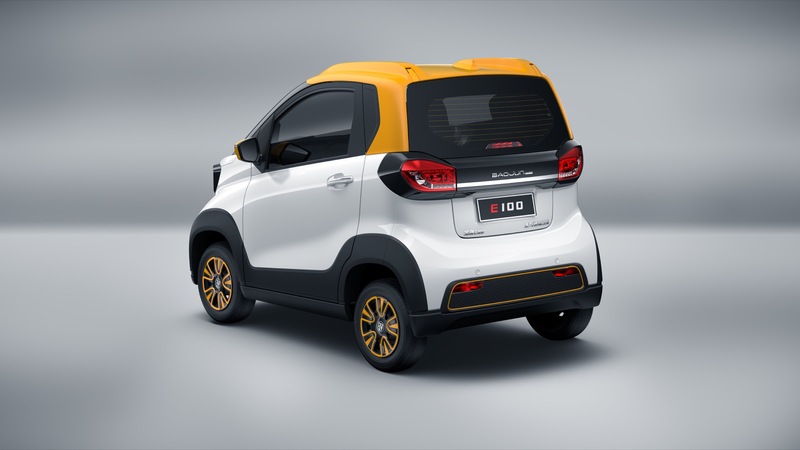 On February 8, 2018, SAIC-GM-Wuling announced that the Baojun E100 electric vehicle will become available to more customers in more cities throughout Guangxi Zhuang Autonomous Region. Customers were able to place orders on the Baojun E100 website (www.baojunev.com) and pick up their vehicles at designated Baojun dealers throughout Guangxi. 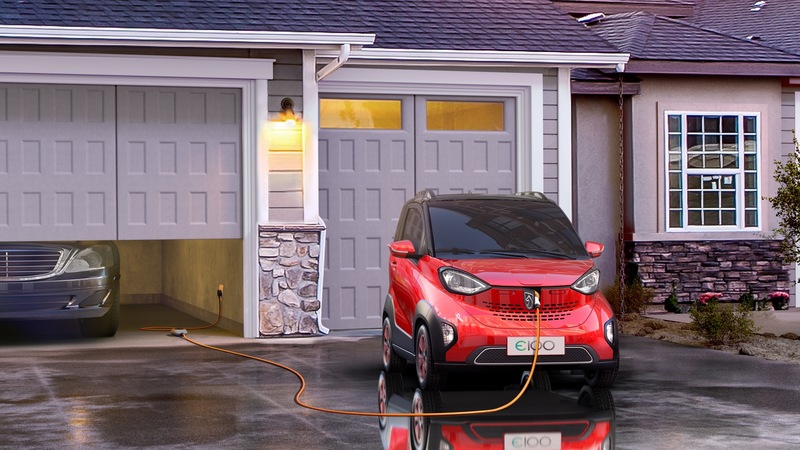 As this was taking place, national subsidies for new energy vehicles in 2018 by the Chinese government were rather uncertain, leading to Guangxi introducing its own program that provides a subsidy of 50 percent the current national incentive, with 40 percent being provided by the regional government and the other 60 percent being provided by the registration location of the vehicle. The original price of the Baojun E100 before subsidies is between RMB 93,900 and RMB 109,900. The Baojun E100 is available in two variants: Zhixing base model and Zhixiang higher-end model. Pricing ranges from RMB 45,800 to RMB 58,800 after national and local subsidies. That converts to about $7,191 to $9,232 USD*. 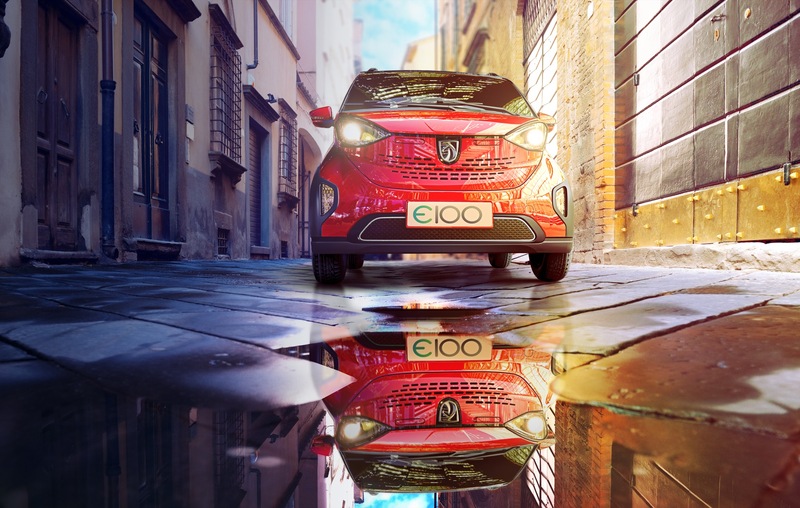 The original price of the Baojun E100 before subsidies is between RMB 93,900 and RMB 109,900, which converts to $14,743 and $17,255*. It is believed that the Baojun E100 is based on a unique platform not shared with any other vehicles. The architecture’s name is currently not known. A total of 11,446 units of the Baojun E100 were sold in the first five months of the model’s launch. Baojun shared a statistic that the E100 accounts for 2.5 percent of passenger vehicles on Liuzhou’s roads. 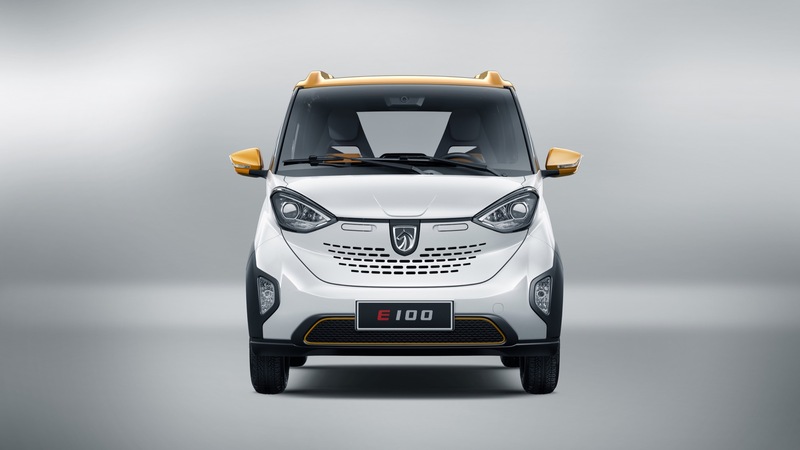 As of September 2018, Baojun announced that over 22,000 units of the E100 have been sold. In September 2018, the E100 was replaced by the the Baojun E200, which features over 200 improvements over its predecessor. Follow our coverage of Baojun news and Baojun E100 news.